I am totally intimidated by anything Martha Stewart. So when I got the opportunity to review a new book by the former craft editor at Martha Stewart Living I thought, "Yeah right. This book is going to be filled with beautiful things that I have no chance to recreating." It turns out I was only half right. I received this book for free from the publisher in exchange for my honest review. This post contains affiliate links. See my Disclosure Policy for details. When Jodi Levine's Paper Goods Projects first arrived, I flipped through it with one of my 3 year olds sitting in my lap. A few pages in, he said "Mommy let's make that!" and by the end he said, "Mommy let's make all of them!" Paper Good Projects is a collection of over 50 crafts made primarily with paper goods you already have or are getting ready to recycle - brown paper bags, paper towel rolls, coffee filters, scraps of cardboard, etc. The projects all look amazing and Martha Stewart perfect, which is no surprise since the author spent 19 years working on Martha Stewart's staff. The crafts are definitely geared towards moms and older children, with lots of fun ideas for birthday parties and children's toys. My 3 year old was mesmerized by the projects but these are definitely out of his league for a few more years. I was worried that they might be out of mine too, but I vowed to give it a shot for a fair and honest review. With Thanksgiving coming soon, I decided to give the Gold Leaf Napkin Rings a try. I had to pick up some gold craft paint but everything else I needed came straight from my recycling bin. The instructions were easy to follow, detailing each step and even including a leaf template in the back (I did mine freehand though). The project was actually pretty simple and didn't take a lot of time at all (except for waiting for the paint to dry). And to my surprise, I LOVED how they turned out! My initial impression of Paper Goods Projects was half right. The book is filled with beautiful projects, but there are crafts for all levels and you do not need to be a Pinterest perfect crafter to pull them off. This book would make a wonderful gift for a crafty mom on your holiday list, or for older kids that love to try new paper projects (my niece is getting a copy for Christmas). Next on our to do list is one of the paper plate masks or perhaps the tube animals. Or as my son suggested, maybe we will make them all! 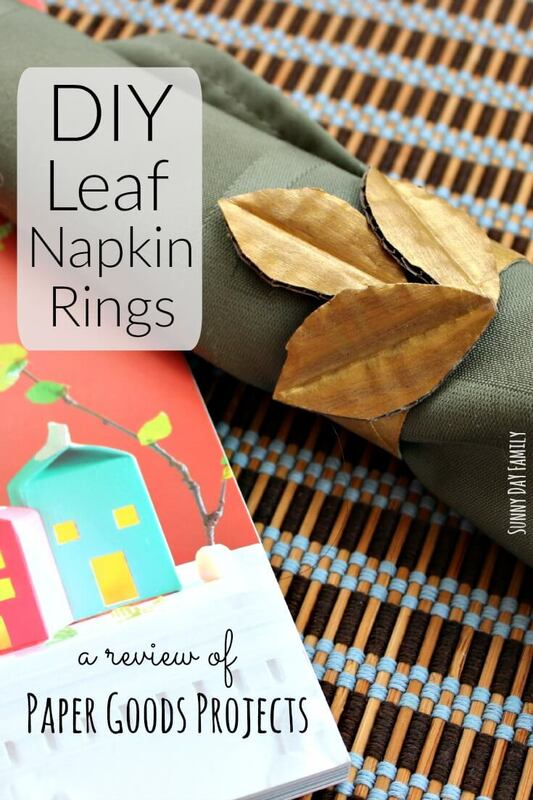 To find the instructions for these Leaf Napkin Rings and more than 50 other awesome paper crafts, check out Paper Goods Projects here! What's your favorite paper project? Leave a comment below or message me on Facebook and let me know. Share a photo too! I always think the same thing whenever Martha Stewart's name is attached to something - beautiful things I'll never be able to do! You rocked those napkin rings though - love them! Thanks Emma! They were actually really easy too! They look really classy. I love an easy project or two! Do pinterest perfect crafters really exist? I think everyone has a few horrific fails they never let anyone know about! I know we certainly do!